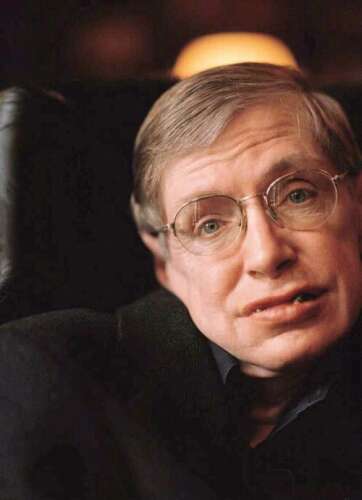 Stephen William Hawking was born on 8 January 1942 (300 years after the death of Galileo) in Oxford, England. His parents’ house was in north London, but during the second world war, Oxford was considered a safer place to have babies. When he was eight, his family moved to St. Albans, a town about 20 miles north of London. At the age of eleven, Stephen went to St. Albans School and then on to University College, Oxford; his father’s old college. Stephen wanted to study Mathematics, although his father would have preferred medicine. Mathematics was not available at University College, so he pursued Physics instead. After three years and not very much work, he was awarded a first class honours degree in Natural Science. Stephen then went on to Cambridge to do research in Cosmology, there being no one working in that area in Oxford at the time. His supervisor was Denis Sciama, although he had hoped to get Fred Hoyle who was working in Cambridge. After gaining his Ph.D. he became first a Research Fellow and later on a Professorial Fellow at Gonville and Caius College. After leaving the Institute of Astronomy in 1973, Stephen came to the Department of Applied Mathematics and Theoretical Physics and since 1979, has held the post of Lucasian Professor of Mathematics. The chair was founded in 1663 with money left in the will of the Reverend Henry Lucas who had been the Member of Parliament for the University. It was first held by Isaac Barrow and then in 1669 by Isaac Newton. Stephen Hawking has worked on the basic laws which govern the universe. With Roger Penrose he showed that Einstein’s General Theory of Relativity implied space and time would have a beginning in the Big Bang and an end in black holes. These results indicated that it was necessary to unify General Relativity with Quantum Theory, the other great Scientific development of the first half of the 20th Century. One consequence of such a unification that he discovered was that black holes should not be completely black, but rather should emit radiation and eventually evaporate and disappear. Another conjecture is that the universe has no edge or boundary in imaginary time. This would imply that the way the universe began was completely determined by the laws of science. His many publications include The Large Scale Structure of Spacetime with G F R Ellis, General Relativity: An Einstein Centenary Survey, with W Israel, and 300 Years of Gravity, with W Israel. Stephen Hawking has three popular books published; his best seller A Brief History of Time, Black Holes and Baby Universes and Other Essays, and most recently in 2001, The Universe in a Nutshell. There are .pdf and .ps versions of his full publication list. Professor Hawking has twelve honorary degrees. He was awarded the CBE in 1982, and was made a Companion of Honour in 1989. He is the recipient of many awards, medals and prizes, is a Fellow of The Royal Society and a Member of the US National Academy of Sciences. Stephen Hawking continues to combine family life (he has three children and one grandchild), and his research into theoretical physics together with an extensive programme of travel and public lectures. Read more about him at here.